"Bright white paper and relatively dark ink gives this bill a clean bold appearance. Crisp, with even and adequate margins outlining all features. Faint red signature of George Wylles. Slash cancelled. Upon redemption, these notes were cancelled either by a slash or hole cut. Uncancelled notes are very much the exception to the rule and command a significant premium. Throughout most of the 1700s, many Colonies used the British system of pounds, shillings and pence, with there being 12 pence in a shilling and 20 shillings in a pound. 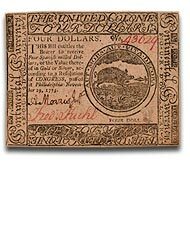 How that later translated into American Dollars varied by State, time and economic circumstances." "A lovely note that is only lightly and evenly toned and free of any problems. Signed by William Pitkin in clear reddish ink. 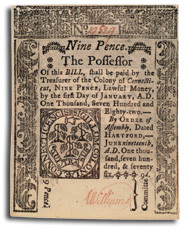 Eric Newman notes in ""The Early Paper Money of America"" that, ""Some Connecticut bills are slash or hole cancelled and others show redemption registration by the comptroller in ink"". This note reveals the latter, along with being slash cancelled, showing in red ink on the lower reverse of the word ""Registered"" followed by a signature appearing to read J. Jeffery. ex. Heritage 2004 Orlando CAA #338." "A rare, very attractive uncancelled example of a Connecticut issue. 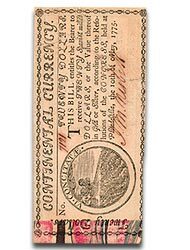 The margins on this note are cut tight against the design on two sides, though without intruding, keeping it from grading higher. Very lightly toned with no spots or problems. Printed by T. Green and signed Williams in clear reddish ink." "This small, almost square note is one sided only (as designed) and printed on paper with a decided blue hue. Very clean and crisp. 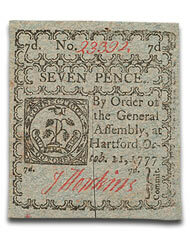 The paper color provides a nice visual contrast to the red signature of J. Hopkins. Slash cancelled. " "A Marbled Edge note. 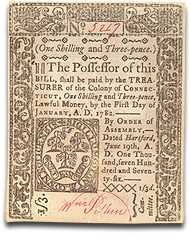 A very dramatic issue and popular within the Continental Currency series because of the unique paper it was printed on. 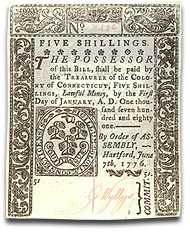 Also known as ""polychromed"", this paper includes multi-colored swirls found at the left border of the notes, and"
"A very attractive early issue of Continental Currency, printed before the United States declared independence, hence use of the phrase ""The United Colonies"" at the top of the note, a practice that continued into 1777 before being replaced by ""The United States"" for the May 20th issues. Well printed on clean, crisp, lightly toned paper free of any problems. A large flake of mica is still embedded in the paper at the right base of the obverse seal. Signed by A. Morris Jr. and Fred Kuhl. ex. Affleck-Ball Collection. ex. Stacks 01/05 Lot 1707 John J. Ford, Jr. Part VIII." Copyright 2005, Casper Coins, Inc.